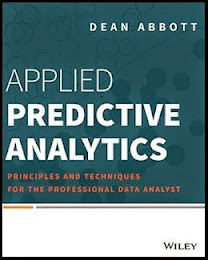 Tips, tricks, and comments in data mining and predictive analytics, including data preprocessing, visualization, modeling, and model deployment. Hosted by Dean Abbott, Abbott Analytics, Inc.
I’ve been reminded recently of the overlap between business intelligence and predictive analytics. Of course any reader of this blog (or at least the title of the blog) knows I live in the world of data mining (DM) and predictive analytics (PA), not the world of business intelligence (BI). In general, I don’t make comments about BI because I am an outsider looking in. Nevertheless, I view BI as a sibling to PA because we share so much in common: we use the same data, often use similar metrics and even sometimes use the same tools in our analyses. I was interviewed by Victoria Garment of Software Advice on the topic of testing accuracy of predictive models in January, 2014 (I think I was first contacted about the interview in December, 2013). What I didn’t know was that John Elder and Karl Rexer, two good friends and colleagues in this space, were interviewed as well. The resulting article, "3 Ways to Test the Accuracy of Your Predictive Models" posted on their Plotting Success blog was well written and generated quite a bit of buzz on twitter after it was posted. Prior to the interview, I had no knowledge of Software Advice and after looking at their blog, I understand why: they are clearly a BI blog. But after reading maybe a dozen posts, it is clear that we are siblings, in particular sharing concepts and approaches in big data, data science, staffing and talent acquisition. I've enjoyed going back to the blog. The similarities of BI and PA are points I’ve tried to make in talks I’ve given at eMetrics and performance management conferences. After making suitable translations of terms, these two fields can understand each other well. Two sample differences in terminology are described here.
' “business intelligence” KPI' yielded 1,510,000 hits. In PA, one is more likely to hear these ideas described as metrics or even features or derived variables that can be used as inputs to models are as a target variable. Interestingly, the top two links for “predictive analytics” “use case” from the search weren’t even predictive analytics use cases or case studies. The second link of the two actually described how predictive analytics is a use case for cloud computing. Interestingly, DM, PA, and even Prescriptive Analytics are considered a part of BI. I must admit, at all the DM and PA conferences I’ve attended, I’ve never heard attendees describe themselves as BI practitioners. I have heard more cross-branding of BI and PA at other conferences that include BI-specific material, like Performance Management and Web Analytics conferences. Contrast this with the PA Wikipedia page. This taxonomy of fields related to PA is typical. I would personally include dashed lines to Text Mining and maybe even Link Analysis or Social Networks as they are related though not directly under PA. Interestingly, statistics falls under PA here, I’m sure to the chagrin of statisticians! And, I would guess that at a statistics conference, the attendees would not refer to themselves as predictive modelers. But maybe they would consider themselves data scientists! Alas, that’s another topic altogether. But that is the way these kinds of lists go; they are difficult to perfect and usually generate discussion over where the dividing lines occur. This tendency to include fields are part of “our own” is a trap most of us fall into: we tend to be myopic in our views of the fields of study. It frankly reminds me of a map I remember hanging in my house growing up in Natick, MA: “A Bostonian’s Idea of The United States of America”. Clearly, Cape Cod is far more important than Florida or even California! Be that as it may, my final point is that BI and PA are important but complementary disciplines. BI is a much larger field and understandably so. PA is more of a specialty, but a specialty that is gaining visibility and recognition as an important skill set to have in any organization. Here’s to further collaboration in the future! This reminds me about when I worked at my last job, the Predictive Analysts were categorized in the Business Analtyics department and the BI analysts were under IT. I'm looking for a Masters program but I'm not sure whether I want to pursue a career in Statistics, Predictive Analtyics, or Data Mining. Seeing that diagram made me realize I have more research to do. Awesome post! This article I think is highlighting a challenge with cross-disciplinary collaboration in general -- the fact is, so much of what everybody does in the world in everyone's various fields of study overlaps quite a bit, but we all like to talk about it in our own way, with our own vocabulary. Learning to overcome this divide is very powerful, because I believe that some of the most creative and innovative developments occur when multiple fields of thought begin to effectively cross-pollinate. So, to point out the similar ideas in Business Intelligence and Predictive Analytics, as you have done, I hope will help bridge this divide in these areas. It can be difficult to do, though, since sometimes Field A "uses" concepts from Field B but the people in Field B might somewhat begrudge that fact, considering the application of Field A to be "below" them somehow. The surface level understanding that Field A's people have of Field B might contribute to this, or perhaps the other way around, also. So here's to changing that attitude -- Let's be willing to admit and accept that even the "middle-school level" version of the topic we are studying can be revolutionary to the "graduate level" research in a different field. A greater communication and awareness of developments in each other's fields can only be a good thing in the end. Completely agree with you that each field builds up its own vocabulary and short-hand descriptions for the concepts important to the field. And, generally, there is very little incentive to build up a broader vocabulary because most of the time, practitioners in their own discipline don't communicate to other fields or even have the need to. The biggest advantage of this kind of cross-disciplinary communication is the cross-pollination of ideas that is so valuable in developing better approaches to solving problems. To cross-pollinate, however, we first have to cross-communicate! Great Post, I was looking for something like this one. Thanks for sharing this amazing information about Digital Marketing, which is helpful for new Digital marketing learner. Thanks for sharing information about business intelligence. In my work, dissertation assistance I am increasingly confronted with business analytics and consider it very informative and indicative. I am looking for IEEE projects for CSE. Can you please Tell me please? I think that running your own form is a really good business. I've been running my company for some time. And I must admit that I'm doing really well. Recently, I even decided to implement different kind of systems and try solutions of Internet of things. I hope that it will contribute to the further development of my company. i learnt new information about data mining and predictive analysis which really helpful to develop my knowledge. This concept explanation are very clear so easy to understand..
We at COEPD provides finest Data Science and R-Language courses in Hyderabad. Your search to learn Data Science ends here at COEPD. Here, we are an established training institute who have trained more than 10,000 participants in all streams. We will help you to convert your passion to learn into an enriched learning process. We will accelerate your career in data science by mastering concepts of Data Management, Statistics, Machine Learning and Big Data. Very useful and informative content has been shared out here.Thanks for sharing. Thanks for sharing with us, This article gives more useful information to me. Great post, keep updating.